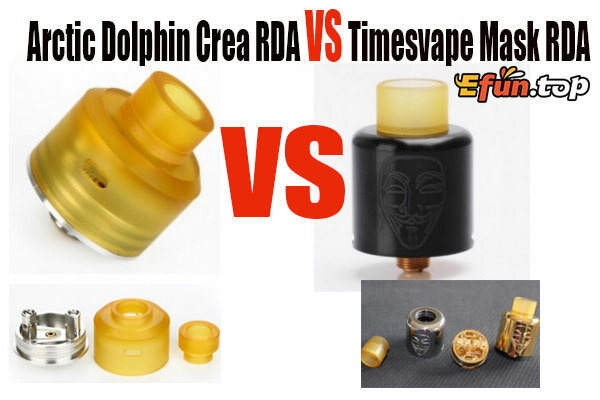 Arctic Dolphin Crea RDA VS Timesvape Mask RDA, Who will win? Today our Arctic dolphin and a mysterious mask opponent, to contest, who will win ? Arctic Dolphin Crea RDA is the same atomizer as that from Crea kit. It's a mini 22mm bottom feeding tank with dual angled side airflow holes. The Crea adopts dual-post single coil build deck for easy building and deep juice well. You can even replace the 510 drip tip with your own one. It's suitable for most Squonk mods on the market. The Timesvape Mask RDA is a 24mm atty with classic bridge clamp design like Goon, which is suitable for fancy coil building. The cap has engraved Anonymous Mask logo on it. The Mask RDA comes with bottom airflow system. The whole base is 24K gold plated to guarantee its conductivity. PEI wide bore drip tip is included. Who attracted you ? Who will win ?